Many are keen to gauge the real estate market at the start of a new year. There are almost as many opinions as the number of commentators. We are not foreseeing any major changes in the fundamentals in terms of supply and demand. Obviously, the Bank of Canada interest rate will have a significant impact effect on the overall market. Rather than guesstimating , let's us look at the actual data. 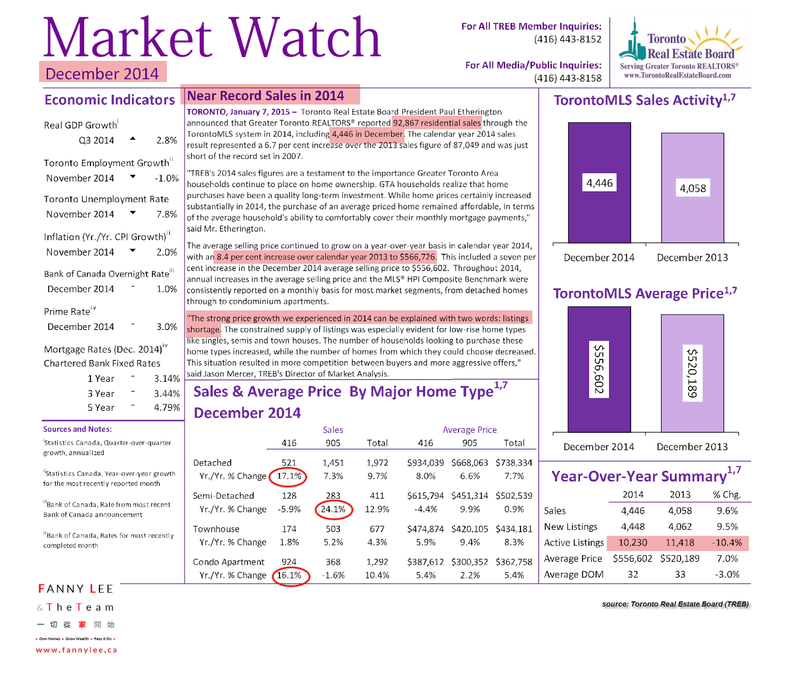 Here are some of our top line takeaways from Toronto Real Estate Board (TREB) December Market Watch. - December recorded 4,446 resales compared to 4,058 a year ago. IT was an increase of 9.6%. - The monthly average home sale price was $556,602, grew 7% in 12 months from $520,189. - Benchmarked against December 2013, detached and high-rise condos in 416 area as well as townhomes in 905 area were particularly active. - Price-wise, semi-detached and townhomes popped up almost 10% year-over-year. - Although 2014 December saw 9.5% more new listings than its 2013 counterpart, the overall active listings have dropped 10.4%. The supplies remained tight. To end this re-cap, like to share words from TREB's Director of Market Analysis Jason Mercer's take of the market. "The strong price growth we experienced in 2014 can be explained with two words: listings shortage. The constrained supply of listings was especially evident for low-rise home types like singles, semis and town houses. The number of households looking to purchase these home types increased, while the number of homes from which they could choose decreased. This situation resulted in more competition between buyers and more aggressive offers."